Of the many associations that spring to mind when someone mentions Barnt Green, the movie business probably isn’t one of them – and neither is the Russian Mafia. But put them all together and you have the ingredients for a surprising creation: Vodka and Chips, a comedy feature film written by, produced by and starring a septuagenarian from Barnt Green. Sheila Evans, who lives in Fiery Hill Road, has been a stage actress for many years, but it wasn’t until recently that she turned her hand to writing dialogue and screenplays for films. 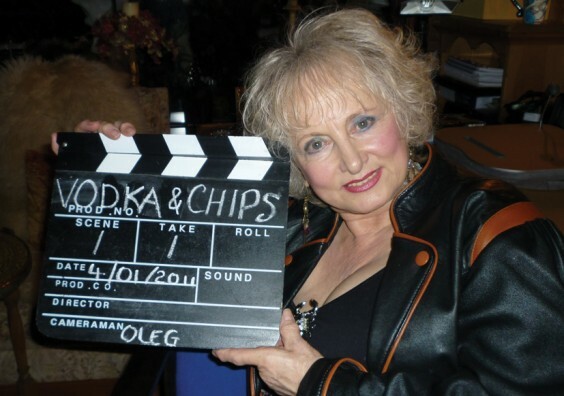 Chief among these was Vodka and Chips, the tale of an eccentric widow who unwittingly befriends a Russian gangster and ends up taking on the Mafia… with Barnt Green as the somewhat unlikely setting. Teaming up with Lex Dovak, a Russian-born director, cameraman and actor, Sheila and husband Bill formed a new company – Thunderstruck Film Corporation – and assembled an enthusiastic local cast and crew, with Bill as production manager. Vodka and Chips was partly shot in Barnt Green and Alvechurch, as well as other recognisable locations including Fletcher’s arcade at Rednal, which has a vital role to play. Produced on a shoestring budget, this enjoyable film – which was screened for the first time at Birmingham’s mac last month – has already attracted the attention of distributors, and was certainly lapped up by the packed preview audience. Shelia revels in the part of Kitty, a lonely and eccentric widow who is being haunted by nightly apparitions, resulting in her having a short stay in a psychiatric unit. Meanwhile in Russia, two Mafia gangsters double-cross their boss Gregor (an enjoyably cliched Mr Big complete with silk dressing gown and large cigar) and flee the country. One of them, young hitman-with-a-heart Vladimir, decides to head for England (due in no small part to his fondness for chips! ), where he discovers that his partner has stitched him up and taken most of the money, leaving him alone and skint on the streets of Birmingham. When Kitty leaves hospital, her sweet niece Penny persuades her to take in a lodger, and their advert is answered by none other than Vladimir. Concealing his true past, he soon becomes one of the family – providing companionship for Kitty, getting her drunk on vodka and even scaring off her ghostly visitor. And, naturally, falling in love with Penny. Back in Russia, Gregor discovers Vladimir’s whereabouts and sends two amusingly if implausibly inept henchmen to England to retrieve his loot. Vladimir is forced to reveal his identity, but feisty Kitty stands by him and ropes in a motley crew of loyal friends – including her married lover, her yoga instructor (a brilliantly deadpan turn) and a gang of bikers (vociferously present and correct in the back row of the screening) – to join her crackpot scheme to fend off the Mafia. One of the film’s key strengths is its music (especially the satisfyingly down-and-dirty title track), created by composer and producer Yuri Mykhaylychen and giving an authentically Russian flavour to proceedings – there’s even a joyous sample of folk classic Kalinka at the end. And for the local viewer, there is much fun to be had in spotting the various landmarks of Barnt Green, Alvechurch and Birmingham. Bill tells us that the whole cast and crew had immense fun in putting Vodka and Chips together – so what’s next for their independent film company? Well, the international flavour continues as a Bollywood producer has snapped up one of Sheila’s scripts. Sheila has already acted in a couple of Bollywood films, after her lifetime love affair with Indian cinema motivated her to learn Hindi. This concept, however, is a terrorist thriller entitled Beyond Belief and is due to be filmed in Scotland later this year. Lex will also be joining the team as cameraman. Meanwhile, Sheila is working on a follow-up project – a psychological thriller (working title Cellar Whispers) to be shot on location in the Midlands. “With Vodka and Chips, hopefully we have proved ourselves reliable and talented enough that prospective producers will want to join us in future projects,” concludes Bill.